Firstly, thank you to everyone who commented on my previous post about the Retro Chick dress. I normally like to reply to comments individually if I can, but this week I have had an enforced break from using the computer (which is also why this particular post is being finished later than I ideally would have liked!). I have been super busy trying to get some coursework finished and I was also not supposed to use my hands much as I have had some treatment for an ongoing problem with my wrists and I was instructed to rest them. I have been spending my time watching endless amounts of Star Trek and taking painkillers like they're going out of fashion! 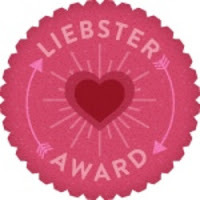 Now that I have the chance to do a bit of typing though, I am pleased to be able to accept a Liebster Blog Award from Bruce Partington-Plans at Eclectic Ephemera. As per usual, my thanks go to Bruce for the award and I must also take this opportunity to mention how excited I am by your name. I am a huge Holmes fan! The rules for this award are as follows: thank the person who gave you the award, answer the 11 questions they have asked you, give 11 facts about yourself and then pass on the award to 11 of your favourite bloggers. - I started blogging because it seemed like a good way of expanding my knowledge of the decades I am interested in, gaining inspiration from others and documenting things such as the re-enactment events I like to go to. 2) Is your family understanding about your love of vintage and your desire to blog about it? - Sort of. My mum in particular struggles to understand that I would like to dress in a vintage style on an everyday basis; she tends to think to my clothes as 'outfits' or 'costumes' which are worn mainly for re-enactment. 3) What country would you most like to visit? - Honestly, I'm not a big traveller. I like seeing other countries on television, for example, but I haven't ventured very far out into the world. I am considering applying to do a Masters degree in America though, so we'll see. 4) When did you discover vintage? - I started listening to 1940s music when I was about 14 - so about 7 years ago. I also played a lot of 30s and 40s swing and some 50s rock and roll in a swing band I was a member of (I played the saxophone!). I went to see the Glenn Miller band with my family around that time as well. I started dressing a bit in a (roughly speaking) modern rockabilly style on a fairly casual basis about two to three years ago; my personal style has started to evolve into a more serious or authentic vintage style over about the last 6 or 8 months. 5) What is your favourite vintage shop? - I'm going to have to give a completely cop-out answer here and say Etsy. I've mentioned before that vintage shops in my area are very few and far between. We have, I think, three in my city - one which sells mostly jewellery and home ware, one which is mainly newer vintage (so many ugly sweaters and Doc Martins) and one which I was convinced didn't exist until last week when I eventually stumbled upon it. It's very well hidden in the basement of another shop and I haven't had the chance to visit it yet, so I don't currently know what it actually sells. There are other vintage shops I like in other nearby cities, but due to university and work commitments, I haven't had the chance to visit them in the last several months. Most of my vintage clothing is therefore from various sellers on Etsy; my reproduction and rockabilly items are mostly Collectif, Hell Bunny and H&R London (which I buy from here) - and now of course Lady K Loves! This photo of me is from mid-2011. 6) Is there a lot of vintage in the city where you live? - No! Apart from the lack of vintage shops I mentioned above, there is virtually no vintage clothing available in the charity shops (although there is a small amount to be found) and there is no vintage scene. I usually only see other people wearing vintage when there are events such as Judy's Vintage Fair that attract vintage-wearing people. 7) Did you discover new hobbies or interests after you discovered vintage? - I would say that for me, it sort of happened the other way around. I discovered vintage after I discovered new hobbies and interests - that is to say I started going to burlesque shows and then to re-enactment events, and my style evolved to match my new interests. 8) What famous person from the past or present do you think you look like? - I have been told a few times I look like Emma Watson although I can't much see it myself. In another life, I would like her brains and her money, please! 9) Who is your favourite author? - I have always read a lot, so it's hard for me to choose just one as a favourite! 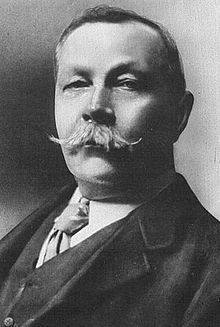 These days I read a lot of crime novels; I like Patricia Cornwell for contemporary crime fiction and of course as I mentioned above, Arthur Conan Doyle takes up a large space on my bookshelf. Just look at those impressive whiskers. 10) When you sit down to write a blog post, do you plan/think ahead or just write off the cuff? - It depends on the post. Both my capsule wardrobe posts and my Lady K post were planned, for example, but this post is being written off the cuff. 11) If you could be a fly on the wall for any event in history, what would that be? - When I first read this, I thought it was going to be a really hard question which I wouldn't be able to think of an interesting answer for. However, in light of recent events, I think I will say I would like to have been watching at the point at which Richard III was killed. I'm not sure how far this news has travelled, but for anyone who doesn't know, his body was recently found buried under a car park in Leicester. 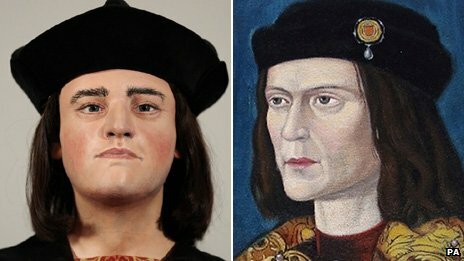 Facial reconstruction of Richard III. 1) I am very right handed so I did somewhat struggle when my right hand was put out of use this week! 2) I used to play the clarinet, and have also dabbled with the saxophone, drums and piano. Another thing that had to stop when the problem with my wrists started. 3) My favourite thing I have studied whilst doing my university course is entomology (the study of insects). After I graduate, I am hoping to go and work in this field. 4) I am terrified of clowns. 5) I have previously had 8 piercings in my ears. I currently have two lobe piercings in each and a tragus piercing in my left ear, though now I mostly only wear earrings in my first lobe piercing and in my tragus. 6) I organise all my books, DVDs and CDs into alphabetical order and genre, and my wardrobe is organised by colour. No other aspect of my life is this tidy! 7) I have never broken a bone. 9) I own a fez (not a real one) and a croupier's hat (also not a real one). 10) I attended a post-mortem at the end of last year as part of my university course. 11) I have all four of my wisdom teeth. 1) What was the first vintage (or reproduction) item you ever purchased? 2) Do you wear vintage every day or tone it down for certain occasions? Why? 3) Does your interest in vintage apply only to clothing, or also to things such as home ware, music, films etc? 4) What fashion or beauty trend (of any era) do you dislike the most? 5) Who is your fashion idol? 6) Night out or night in? 8) Do you have any tattoos? If not, would you ever get one? 9) What is the most you've ever spent on an item of clothing? 10) What is your favourite holiday? 11) What it your hope for the future? I really hope this post wasn't hopelessly TLDR! Congrats on the award! Loved reading more about you and getting links to more lovely blogs to read. I am a huge history buff and the Richard III thing has been so interesting to read. I love how eclectic your answers are! Thank you so much for including me! I feel very honored. I just want to let you know though that I have received this blog three times previously and thus may or may not participate as each time I struggle to find blogs to pass it along too. Thank you so much for tagging me darling!